Tim and I met 17 years ago while we were both living in Las Vegas. It was pretty much immediately love and a month or so later, he brought me home to meet the family. Home just happened to be Chicago, and I’d never been there before. Aside from family time, we did all the touristy things one does in the Windy City: we ate all the things at Taste of Chicago, we met Sue at the Field Museum, we got splashed by the marine mammals at Shedd Aquarium and we took the elevator up to the 103rd floor of the (then Sears Tower) Willis Tower. We’ve been back to Chicago together a few times since, but we mainly skipped being tourists in his hometown. This time, though, we couldn’t resist a Chicago deep dish pizza at one of the best seats in town. And we’re not debating which Chicago pizza joint has the best deep dish; that’s a futile argument. Back up on the 103rd floor of the Willis Tower Skydeck, we enjoyed a deep dish pizza after hours at a table steps away from the glass-floored ledges that jut out of the Willis Tower. Our VIP Pie in the Sky dinner at Skydeck Chicago was definitely in our top 5 of the most unique places we’ve ever had a date night. 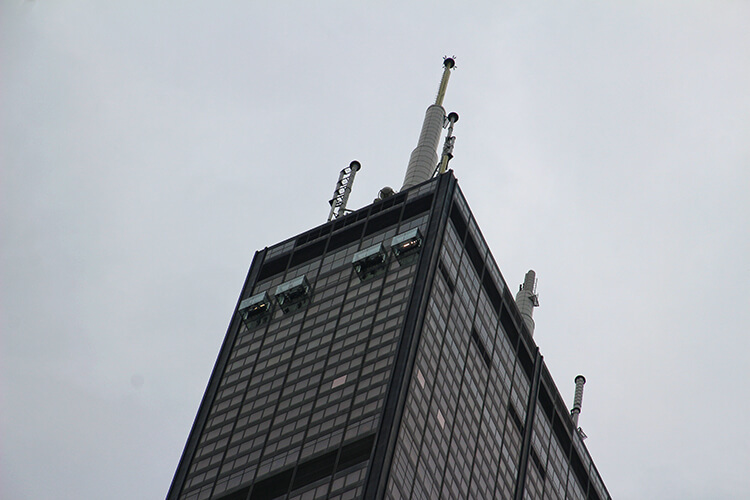 It’s after hours when the approximately 25,000 daily visitors to the Willis Tower have left. It’s so quiet in the normally bustling office building that you can hear a pin drop. Perched 1,353 feet above the glittering streets of downtown Chicago, a red and white checkered table awaits just steps away from the glass enclosed ledges that jut four feet out from the Willis Tower. The Willis Tower (though it will always be the Sears Tower to us) is the 12th tallest building in the world and the 2nd tallest building in the United States. From March through September at 11pm and October – February at 9pm, just four parties each night have access to one of the most unique dining experiences in Chicago, if not in the world. Giordano’s, who has been making deep dish pizza since 1974, caters the occasion with a 3-course meal that, of course, includes a steaming hot and freshly delivered Chicago-style deep dish with your selected hodge-podge of fillings. We actually don’t know how we got so lucky, as the dinner in the sky Chicago experience is typically sold out, but as we were greeted in the lobby of the Willis Tower we were informed we’d be the one and only party that evening. Our VIP experience would truly be the ultimate VIP experience. Not only did we luck out in somehow being the only party that night, the weathermen were wrong and the cloudy night that was predicted ended up being crystal clear. It was perfect for watching the full moon rise and reflect off of Lake Michigan. When the Pie in the Sky dinner at the Willis Tower began, the tables were positioned right in the Skydeck ledges. But some diners had a little trepidation sitting at a table on a glass floor jutting 4.3 feet out above Wacker Drive. I was surprised to see that Tim even had a little trepidation about just standing in the glass boxes, while I teased him and jumped up and down 103 stories above the street. Our Skydeck Chicago guide for the evening told us that people do all sorts of crazy things in the ledges from handstands to jumping shots. The ledges are built to withstand 4 tons of pressure and hold 10,000 pounds, so I’d have been fine with sitting at a table right in the ledge. We were free to roam the entire Skydeck, which is the entire 103rd floor, while we waited for our salads to be served. We’ve been to the viewing decks of a lot of buildings around the world including the Burj Khalifa, Empire State Building and Stratosphere Top of the World, but we’ve never had it entirely to ourselves. There was no waiting or pushing to get in for a look at the view. We could take our time pointing out sights on the Chicago skyline and taking photos of the city lit up with what must be billions of amber colored lights far below. Bring your appetite, because dinner for 2-3 people includes a 12″ stuffed Giordano’s pizza with up to 6 of your selected fillings. We went for half with salami and Italian sausage and the other half with meatballs and Italian sausage. With a slightly sweet caramelized crust, cheese, cheese, more cheese and your fillings, one slice of deep dish is really enough. But it’s so good that you’ll definitely want more than one! If you can’t finish a whole deep dish pie (and I’d be seriously impressed if you could between two people), the rest will be packaged up for you to take home. Trust us – it makes an excellent pizza for breakfast. 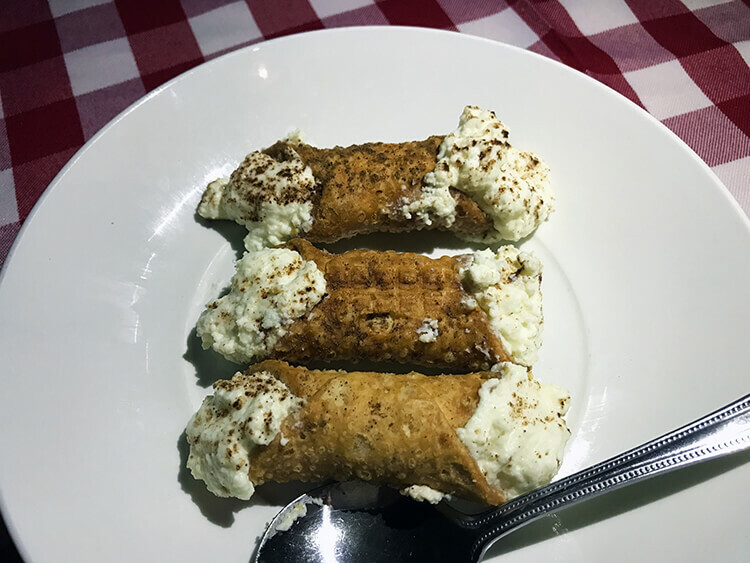 Save some room for dessert because you have a choice of tiramisu or a plate of mini cannoli. Date night does need to be alcohol free, for now anyway, since Giordano’s doesn’t have an off-premises liquor license. They’re working on, but perhaps you’ve heard just how tough it is to get a liquor license in Chicago. Chicago has tons of great BYOB restaurants, but Skydeck Chicago isn’t one of them. And if staying up that late is just a little past your bedtime or you want to make it a special experience for the whole family, there is also a Pie in the Sky lunch available on Saturdays and Sundays throughout the year – though it takes place a few floors down on the 99th floor of the Willis Tower. After enjoying the VIP lunch on the 99th floor, you head upstairs to the 103rd floor for the Chicago Skydeck experience with fast track entry. Considering the general admission for Skydeck Chicago is $23 per adult and a 12″ deep dish at Giordano’s is $29, the $100 per person price tag for the Pie in the Sky dinner at Skydeck Chicago is well worth the unique experience. W Chicago City Center is just a short walk down Adams directly to the Willis Tower. A more budget friendly option is the Central Loop Hotel, also on Adams. Both hotels are an excellent location for exploring Downtown Chicago, Millennium Park and the Museum Campus. Pie in the Sky VIP dinner at Skydeck Chicago is often sold out, so we suggest booking as soon as possible. Book and make your menu selections online. Breakfast in the Sky is offered before opening hours Monday – Friday and Lunch in the Sky catered by Giodano’s on the 99th floor with a fast pass entry to Skydeck Chicago on the 103rd floor is also offered on Saturdays and Sundays. Our Pie in the Sky dinner was provided by Skydeck Chicago in order to bring you this story. However, Luxe Adventure Traveler maintains full editorial control of the content published on this site. As always, all thoughts, opinions, and enthusiasm for travel are entirely our own. This article contains affiliate links. When you book on Booking.com or Viator through our affiliate sites, we earn a small commission at no additional cost to you. Wow! What a spectacular view! It sounds like a truly amazing evening. I remember how good Giordano’s pizza is. it was years ago in high school on a trip to Chicago that I had a slice that I can still taste. But we didn’t have that stunning view. This looks like a must do experience in Chicago! What an awesome experience you had!! The views are absolutely stunning! What kind of camera were you using? I’ve been to Chicago once but it was such a short trip for my old job. I’d love to go back and explore more someday! We used a Canon Rebel SL1 and a tripod. WHat an awesome view. I’ve tried deep dishes in Chicago and it was great. But having it in a place with a view—- makes the experience better. I really want to experience Chicago and that Pizza Pie Wow I want that right now. Normally the view is what I would have noticed first but that Pizza had all my attention haha. You can’t go to Chicago and not have a deep dish pizza. The location just takes it over the top! 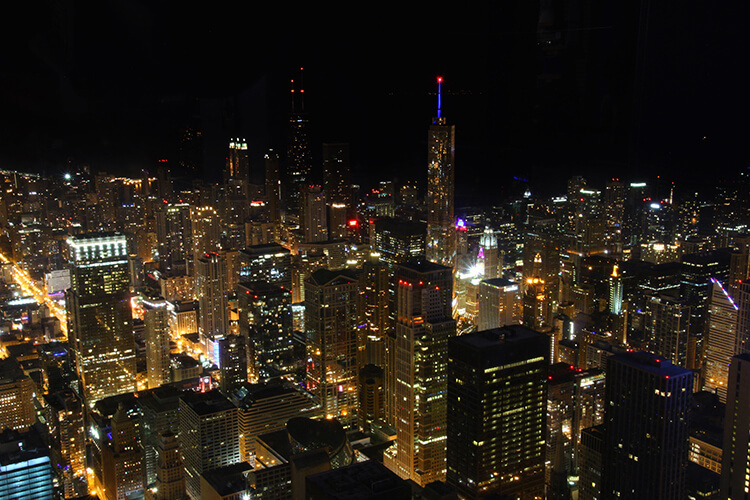 The city lights viewed from one of the tallest buildings in the world is stunning, Jennifer! Looking forward to read more about interesting locations for date nights from you and Tim! This looks like a pretty incredible date night! I didn’t even know that this was an option at the Willis Tower! I may have to do this on my next Chicago Trip! It has been offered for a couple of years now. We highly recommend it and agree it is in our top 5 unique dining experiences anywhere in the world. Pie in the Sky looks amazing. That’s a serious pizza. Hopefully, I would have plenty of time to eat my pizza, watch the moon rise, and city lights sparkle beneath you. I would take a while to even finish that first slice. The experience is about 2 hours, which is at least twice as long as any restaurant in the US would generally allow you to occupy a table. We weren’t rushed in any way and thoroughly enjoyed the experience. Man, I’m hungry for pizza now. I remember the first time I had deep dish in Chicago I was overwhelmed with how huge it was! 6 fillings sounds outrageous, plus cannolis? What a treat! Six fillings I think would be a bit much. We really like 2-3 fillings and keeping it pretty simple. It’s a delicious pizza pie, but you definitely don’t need more than 1-2 pieces! 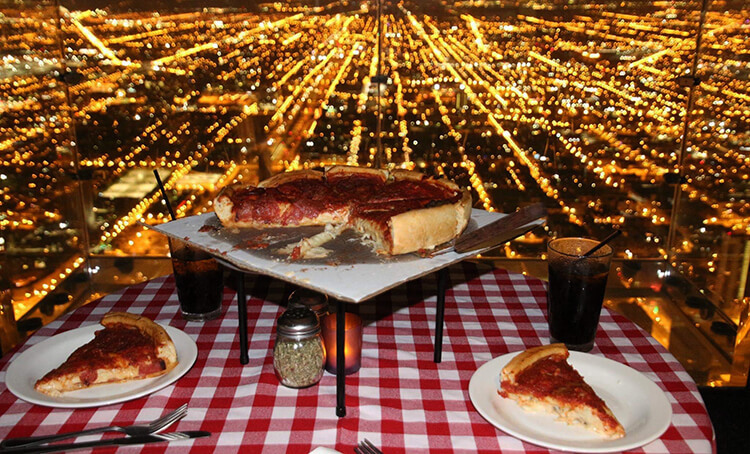 You had me at your picture of the deep dish pizza with the incredible view Chicago! I can’t think of a better location for date night. I can’t believe you had the entire place to yourselves. A truly unique experience that I’ll be sure to share with friends looking for something different in Chicago. We really lucked out that no one else booked for the night. We did it on a Sunday night after the 4th of July holiday, so I think the timing just meant tourists were already headed home. 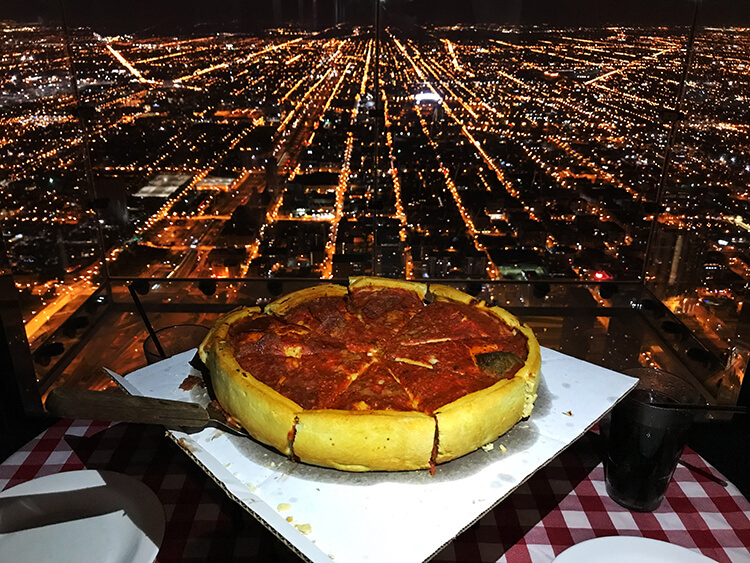 I\’ve heard a lot about Chicago deep dish pizza, though didn\’t realize you could enjoy a pie in the sky! This sounds like the perfect date night! My husband and I got engaged in a revolving restaurant in Canberra, though each of the sky decks we\’ve been to have all been over the top luxury cuisine, where they serve tiny portions and it\’s too posh a scene. We\’re more pizza people honestly!! 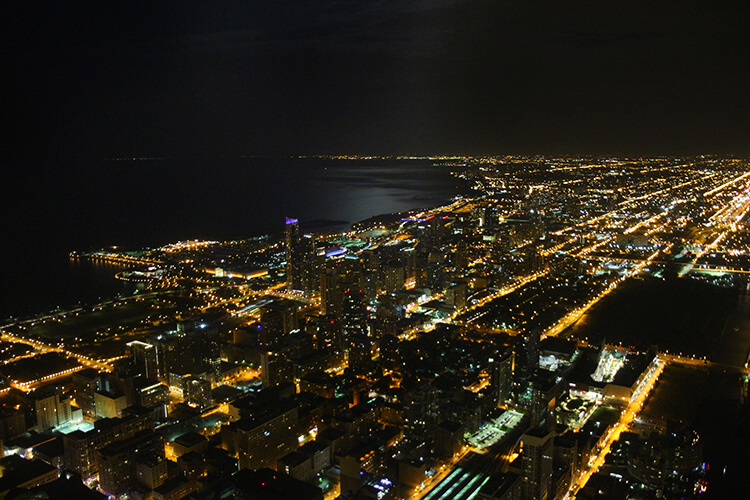 So incredible that you had the whole skydeck to yourselves, and for the weather to be so clear – epic date night!